To prepare sauce: Whisk coconut milk, cilantro, curry paste, brown sugar and salt in a small bowl. To prepare tofu: Drain and rinse tofu; pat dry. Slice the block crosswise into eight 1/2-inch-thick slabs. Coarsely crumble each slice into smaller, uneven pieces. Heat oil in a large nonstick skillet over high heat. Add tofu and cook in a single layer, without stirring, until the pieces begin to turn golden brown on the bottom, about 5 minutes. Then gently stir and continue cooking, stirring occasionally, until all sides are golden brown, 5 to 7 minutes more. 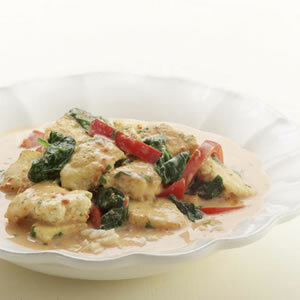 Add spinach, bell pepper and the curry sauce and cook, stirring, until the vegetables are just cooked, 1 to 2 minutes more. Ingredient Notes: Look for reduced-fat coconut milk (labeled “lite”) in the Asian section of your market. Red curry paste is a convenient way to add heat and complexity to a recipe. Look for it in small jars in the Asian section of the supermarket.